A byzantine NCAA rule strikes again! 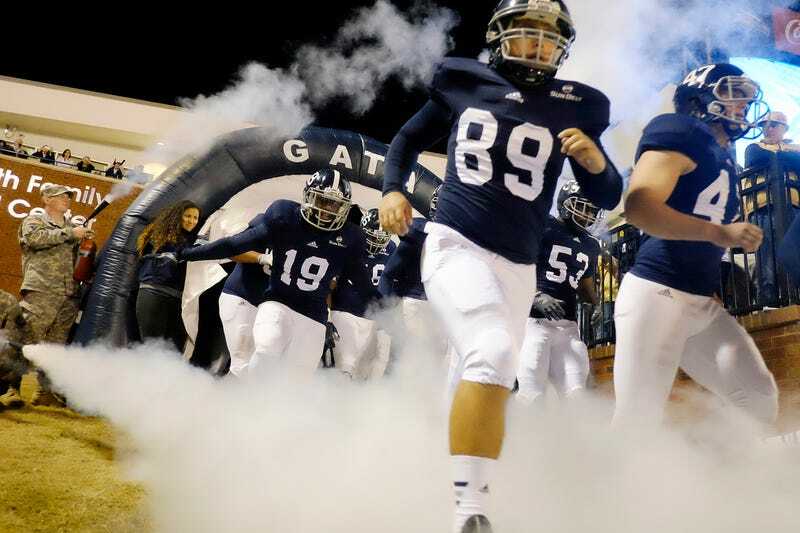 Georgia Southern's football team just completed a triumphant season, going 8-0 in conference play to win the Sun Belt Conference. They were 9-3 overall, with the three losses coming against bowl-eligible teams, including a narrow 42-38 loss away to the now-12th ranked Georgia Tech. But despite their success, they won't be playing in a bowl game, not even one of those crappy ones with a sponsor you've never heard of. That's because Georgia Southern is playing its first year in the Football Bowl Subdivision (FBS, formerly known as 1-A), after 30 years in the Football Championship Subdivision (FCS), and NCAA rules prohibit a team in its "transition season" while moving up divisions from playing in the postseason. That's right, if a team manages the very difficult task of achieving success in their first season in a more competitive division, they're rewarded by being ineligible to play in the postseason. Georgia Southern requested a waiver from the NCAA, was denied, appealed the denial, and today had that final appeal denied, as first reported by USA Today. Georgia Southern's best chance to get into a bowl game was lost when 80 teams achieved bowl-eligibility—winning six games—by this weekend. With 38 bowls and therefore spots for 76 teams, that means four bowl-eligible teams will be staying home this postseason, and the NCAA wasn't willing to make that five by letting Georgia Southern in. "The FCS members insisted upon it because they didn't want people moving from FCS to FBS too easily, so they felt like this year of transition helped them keep their members in FCS," Waters said. "We can debate whether it does or not. "Then the FBS membership kind of said, 'OK, sure we understand that, we'll go along with that but our reason for going along is because (players) can transfer from FBS to FCS and become eligible immediately. They said, 'We don't want a bunch of people to transfer in May from all of our programs and in September we see them again playing for bowl spots.' "
Neither of these arguments hold any water. Moving from the FCS to the FBS isn't something schools do on a lark, and they are not going to be dissuaded from doing so by being ineligible to play in the postseason their first year. Georgia Southern, for instance, studied the move for years, and needs to raise almost $40 million in the coming years to finance it. In fact, an NCAA study (described by ESPN) found that the 19 schools that moved from FCS to FBS from 1978 to 2010 had decreased success and had to use more student fee money to support their program. There are plenty of reasons for teams to decide not to move from the FCS to the FBS (like James Madison did earlier this year), but this rule isn't one of them. The FBS members's reason for going along with the rule is similarly bunk. According to Waters, they fear a bunch of players will transfer from higher-profile schools (practically every FBS school is higher profile than one like Georgia Southern) to an FCS school, and then lead that school—which even with these hypothetical players is at a massive resource and talent disadvantage compared to any school that has been playing in the FBS for awhile—to a bowl game in their transition season. That's just not a remotely realistic scenario, but hey, they wouldn't be the NCAA we know and love if their rules were logical!